What a mix! Half Finnish and half Chinese! Sounds like she is a softee! 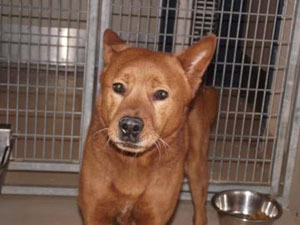 Kaylee is a beautiful 5-year-old Finnish Spitz/Chow Chow mix who weighs 40 pounds. She’s back at Lollypop Farm for a second time through no fault of her own. Her previous owner thinks she deserves more attention. Kaylee loves to get outside for a walk and considers anyone with a leash to be her new best friend. When given the opportunity, she enjoys being let off her leash to run freely. You won’t want to keep your hands off of her gorgeous, thick auburn coat! This smart cookie is a quick study and likes to learn new things. Children over the age of 12 are recommended. Kaylee might prefer to be the only pet in the household. Kaylee is keeping her paws crossed that she’ll soon find a forever home to call her own! Violet, the cat from last week is still waiting to be adopted.